If you’ve looked at our list of “What’s In Season?” and then looked at your garden or a planting calendar, you may be wondering how it is possible for all of these things to be in season at the markets for our local farmers? Are they cheating? Are they using some type of magic or witchcraft? Do they know something that the average Kansas gardener doesn’t know? The answer is No! No! And Maybe! Many of our local produce growers are using season extension techniques to help them beat the Kansas weather – spring, summer, and fall. I have been very impressed with the wide array of produce that is available locally, despite a pretty challenging spring of early warm, then rain, then cold, then more rain. Some of the season extension techniques that local producers use include overwintering crops, row covers (low tunnels), hoophouses (high tunnels), and greenhouses. In the early spring, the farmers bringing spinach and carrots to the market were most likely harvesting from plants that were planted last fall, either outside or under cover. Farmers can use row covers or low tunnels to protect crops from unseasonable cold spells and keep things just a little warmer, enabling earlier harvests of spring leafy greens and root vegetables. 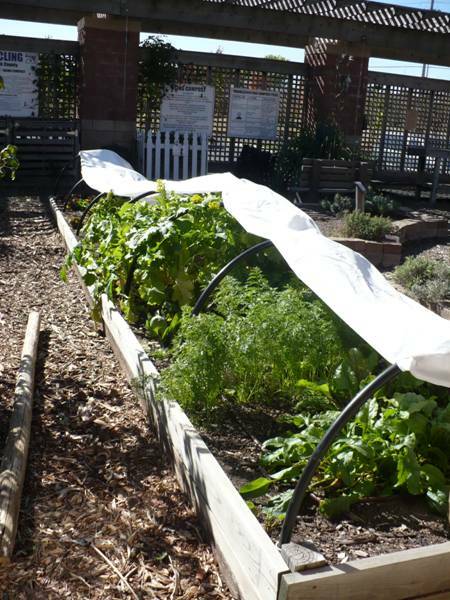 These covers can also sometimes be used to help exclude insects or provide a little bit of shade during the hot summer. They can also protect plants from the worst of the Kansas wind and prevent grit and dirt from getting into hard-to-clean places. 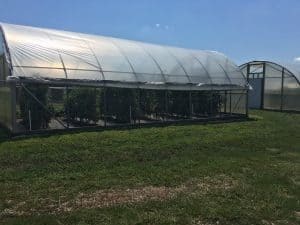 An increasing number of our local farmers are also using high tunnels to get their crops ready for market earlier in the spring. A high tunnel is simply an unheated, lower cost greenhouse where the vegetables are still planted in natural soil. They rely on the sun to warm the air and soil inside the tunnel, allowing vegetables, fruits, and flowers to be planted earlier than normal, or even grow throughout the winter. Then the plastic covering keeps the warm air inside when the temperatures drop each night. Another benefit to the high tunnel is that when we have rainy weather, the crops are protected. They don’t get washed away or drowned. They just happily keep on growing! (And it’s more enjoyable for the farmer to work and harvest too!) By keeping the rain off, it also prevents a lot of diseases and other weather related problems that we experience in our outdoor gardens. Growers using high tunnels in the summer for tomatoes tend to have more tomatoes to harvest with fewer cracks. Using shade cloth can also help keep plants cool and productive during the worst of our Kansas heat. If you remember the awful, hot, dry summers of 2011-2012, when it was too hot for most of us to have tomatoes, farmers using high tunnels had more tomato production than those relying strictly on field production. The other way that producers circumvent the crazy weather is by using greenhouses. The main difference between a high tunnel and a greenhouse from a production standpoint is that a greenhouse usually has a heating and cooling system. Some can even have supplemental lighting. This makes them completely independent of most of the vagaries of weather (beyond how much it costs to heat or cool). We also have several local producers using greenhouses and hydroponic systems to provide you with lettuces, tomatoes, and a few other crops throughout much of the year! So now you know…it’s not cheating, magic, or trickery bringing great vegetables to your tables. It is science, technology, and farmer ingenuity making the best of our crazy Kansas weather!